The La Quinta Inn & Suites North Little Rock - McCain Mall has been awarded the 2016 TripAdvisor Certificate of Excellence award. Samsung Flat-panel TVs with 30 channels of HD programming. Easy-access Plug-and-Play feature makes it simple to connect electronics. 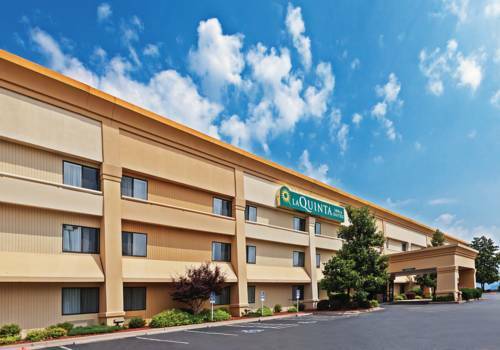 The Newly Renovated La Quinta Inn & Suites North Little Rock - McCain Mall, is conveniently located adjacent to McCain Mall and within walking distance of many wonderful restaurants, like Johnny Carino's, IHOP, and Shorty Small's. Set out from here for such attractions as The Old Mill, the Clinton Library, and The River Market, a diverse medley of owner-operated shops and exciting cultural experiences. If you are here for events at the Alltel Arena or the Dickey Stephens Ball Park, we would love to have you as our guest. You are about ten minutes from Little Rock Air Force Base and Camp Robinson. The delicious Free Bright Side BreakfastTM is available every morning in the lobby at the La Quinta Inn & Suites North Little Rock - McCain Mall. We have a sparkling outdoor pool for your enjoyment and fax/copy services are available at the front desk. Our beautiful room styles vary but all come with many amenities such as free wireless high-speed Internet access and pillow-top mattresses. There is a guest laundry facility on the property and plenty of bus and RV parking, so book as many rooms as you need and stay as long as you want. The La Quinta Inn & Suites North Little Rock - McCain Mall is located five miles north of downtown, not far from City Hall, Springhill Baptist Hospital, and St. Vincent Hospital. On Warden road next to McCain Mall behind Tia's Tex Mex. All reservations must be canceled before 6pm local hotel time on the scheduled date of arrival to avoid being charged one night's room rate plus all taxes. Exceptions may apply during holidays and special events. ~4 miles from Little Rock. Hard as it may be to believe, this is part of the Arkansas State Capitol building tour -- proof that the state's tax dollars are here and haven't been stolen by Arkansas' politicians. ~5 miles from Little Rock. What would you do with 450 dead duck heads? Ruby Abel yanked out all their feathers and sewed them into a coat. ~44 miles from Little Rock. ~52 miles from Little Rock.